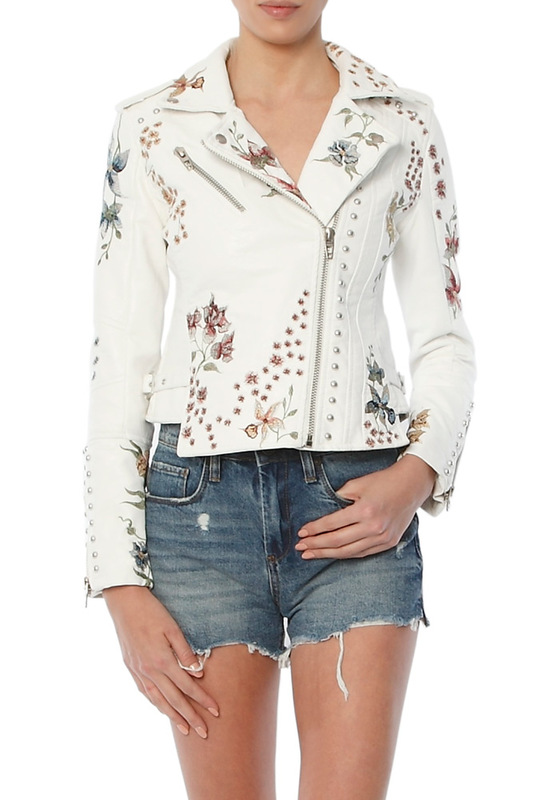 The beautiful Blank NYC Leather Moto ($168) now comes in white! Happy Friday! This week has been a busy one as my boyfriend and I prepare for our Costa Rica adventure, which begins tomorrow. I can’t wait! Along the way I’ve been perusing cute new arrivals at a bunch of stores and my wishlist may just explode. The Morgan Printed Top ($88) is adorable! Everyone could use a cute henley, right? How about the ultra-cute Morgan Printed Top ($88, above)? I love the little hearts in its print! This one is just starting to arrive in stores. I was at nearly all of the NYC Anthropologies yesterday hunting down the dress, and it was out at one and just being unpacked at another. It runs large — you can go down a size. Don’t forget you can use your 20% off perfect pair coupon on this! I’ll be rounding up some more picks for that promo next week before it expires. 1 | Another Anthropologie pickup for my trip is the Waverly Shimmer Top ($118), a beautiful halter top that is cut narrowly through the hips. My usual medium just barely worked, but the top itself is gorgeous! Subtle shine. 2 | I’m also suddenly addicted to rings. I got all three variations of the Stone Stacking Rings Set ($68) and it’s fun to wear them on different parts of my fingers — above the knuckles or below. Look for a shot on my Instagram later today. 3 | Another cute ring set is the Kianne Double-Stack Ring Set ($38), which is tiny, dainty and so cute on! 4 | I also love the Opalescent Sunburst Ring ($48) which looks huge but is smaller than my knuckle in real life. 5 | How cute is this cold shoulder dress? Yes I know many in the community are sick of this trend, but it looks beautiful for spring and summer, a time when I don’t mind my shoulders being bare. 6 | I also love this simple cotton-mix off-shoulder frock, which comes in a soft white or cool grey. 7 | The arrow accent on the Mackage Mini Novacki Leather Crossbody Bag ($240) makes it a bag worthy of my dream list. 8 | I don’t wear oxfords very much but I’d surely make an exception for the Ted Baker London Alelea Oxford ($185)! 9 | This cute Topshop Spot Ruffle Flute Dress ($90) seems perfect for work or catching Spring breezes. It’s also available in a Petites-only variation. 10 | I’m loving this new Collarless Jean Jacket ($128). 11 | The print of the Silk Lace-Up Dress in Assam Floral ($168) is gorgeous! 12 | Waiting for defined waists to come back is painfully slow, but the Button-Down Tie Tunic Shirt ($85) is a good start! 13 | Cute Spring jacket? The Northward Cropped Army Jacket ($110) checks that box. 14 | I’m also quite intrigued by the Eyelet Popover Top ($98). 15 | The Chambray Tie-Back Top ($70) has a great fit and looks good from the front, but it’s ultra-cute from the back! I feel a bun is necessary with this one to really show off those cute accents! 16 | Circle bags are clearly a thing this year (here’s mine!) and The Marfa Circle Crossbody Bag ($118) is a particularly yummy take on the trend. 17 | If you need a cute crossbody, I’m loving The Simple Crossbody Bag ($98) in leather, suede and curry. 18 | Need a good pair of jeans? I’m head over heels for my Brighton Biker Skinny Jeans ($90), which I bought in both colors. They run true to size and do not stretch out much over the course of the day. Really good for talls or long legs! 19 | Although it makes me think of my summers in Cape Cod more than anything, I’m very excited to be bringing the One-Shoulder Ruffle Dress in Seersucker ($158) with me to Costa Rica! It runs small through the hips, which sent me up a size. 20 | I also absolutely am swooning over the Liberty looks for J.Crew — especially this skirt and top paired together! What new items are you loving this morning? Feel free to use this post as an open thread to discuss all things shopping this weekend! I still don’t have a single item of Anthro clothing on my wishlist; but I do have a few items I’m looking at from a few other places. I’m not loving anything anywhere yet – and wondering if it’s because it’s still early in the season or if I’m just not interested in what fashion has to offer this season. (the spring issues of most fashion magazines have not been reassuring – they are mostly awful). I swapped in affiliate links, let me know if you want them back to non-affiliate! And have a wonderful time in Costa Rica!